OK here we go. My Gen 2 track ride will need new tries by the end of this season and the current tire has been dropped. I currently run the Bridgstone BT003's and love them! The 140/70 ZR 17 size seems to be going the way of the Dodo with the manufactures so I need some suggestions. Last edited by I am the stig; 8-4-2018 at 8:09 AM. 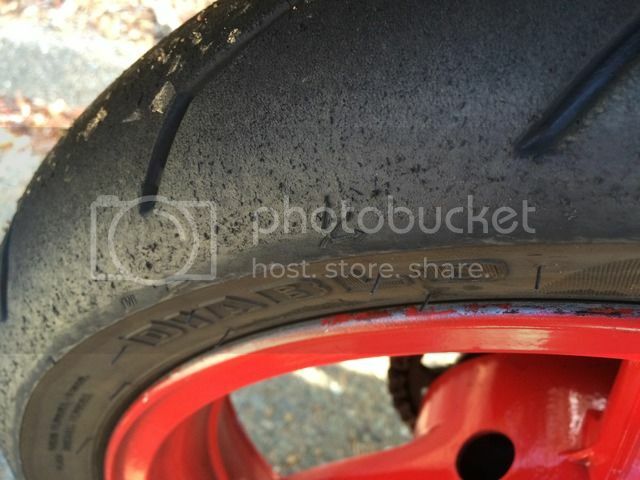 This popped up in the Recent Discussions tab on the side, and even though I have yet to ride track, I've put down quite a few aggressive back road miles on a few different tires at this point. I'm currently running the Pirelli Diablo Rosso 2's on my bike, same size you are running. I've taken it out to a couple really smooth back roads and got into some serious knee scrapers (scrubbed the lower fairing) and never felt either tire try to squirm out from under me. They are wicked soft, you can feel it a little when dropping in quickly into a turn, but they're very planted all the way through. Price is reasonable too, $220-ish for a set off Revzilla. 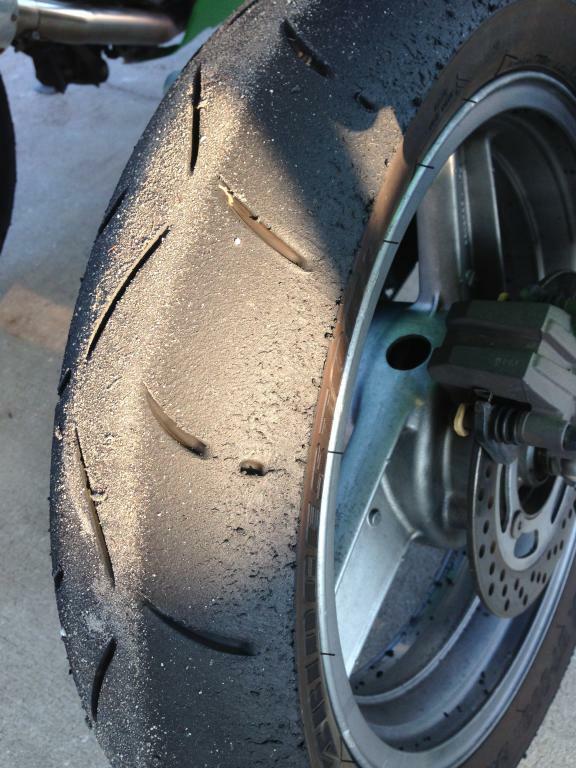 Here's a shot I took of the rear tire after a good 20 minutes on my favorite twisty. I am the stig likes this. I ran the Promaxx Street for years until they stopped selling them stateside. The street version was grippy as hell. Could lean the bike in and down pretty deep with hardly any effort. Dunno if ya wanna deal with the headache of ordering something like that from across the pond though. I've been away for a while and don't know how to add a picture on this new sight. HELP!!!!!! New software/site blows big fuzzy ones. If ya use an outside link (pic hosting like photobucket or whatever) apparently it's easy....? I dunno, I don't use them. Full site is a bit easier to do but full site is hard to read on a small device. Didn't change for me. I've always uploaded pictures to an image hosting site (photobucket for me), copied the image link, pasted it here and I'm good to go. I run a swing arm swap and the Honda 600 F2 Rear rim. which allows use of a 160- 17. We are having an availability issue with the 160 with Track Vendors. With the interest in Track usage of the 300cc/400cc bikes I would suspect a return of some of the smaller sizes. Re: The Swing arm swap. I know there are several combinations that can be used. Investigate those with particular attention to the Rear Brake setup.. I wouldn't advocate my setup because the rear brake caliper holder was literally carved out of a block of aluminum. There may have been some advancements since mine. I run Dunlop 160's in the rear with the stock swingarm. Raced at least a decade like that, no problems. Just got a set of Q3+ to replace the GPA's for track day next week. Not bad, slow to warm but good overall. Closest thing I could find to Maxxis in a bias tire.